Acme Thunderer Camo Whistle - #670. $3.99. "It is the best and loudest whistle I have ever heard!!!" So loud I had to build a cone to go over the outside, as it caused major ear ringing! It is the best and loudest whistle I have ever heard!!! LOVE ACME WHISTLES!! I have some old black ones. This one is fun because it is camo, my son's favorite! "Light...loud and camo! What else could one ask for?" Light...loud and camo! What else could one ask for? "Yea! My dogs know the pitch and responded immediately." I had recently misplaced one I had used for 12 years. 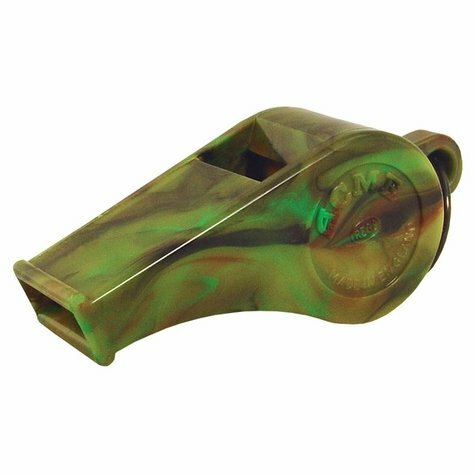 Looked on your web site and found my favorite ACME Thunderer Camo Whistle! Yea! My dogs know the pitch and responded immediately. "I prefer the metal whistle, but use the plastic camo version during hunting season." I prefer the metal whistle, but use the plastic camo version during hunting season.